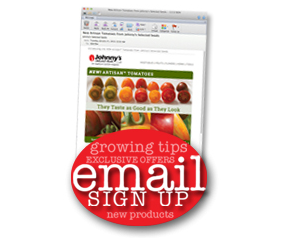 Johnny's has everything you need to graft tomato plants successfully, including rootstock seeds, grafting clips, extensive information and a video. Grafting is not difficult. It involves growing two sets of plants: the variety you want for its fruit, called the scion variety, and a special rootstock variety with extra vigor and/or disease resistance. When the seedlings are a few inches tall, the stems are cut and joined with a silicone clip. The stems grow together, creating a plant that has the strong root system of the rootstock and the desirable fruits of the scion variety. Read "Grafting Tomatoes for Increased Vigor and Disease Resistance for more information. The vast majority of commercial greenhouse tomatoes are grown on grafted plants, which reduces the risk of soilborne diseases carrying over from one crop to the next. Many growers are now using grafted plants for their field-grown tomatoes as well, due to the grafted tomatoes' higher yields. This year, Johnny's will also have a limited offering of tomato seedlings for growers in the Northeast, including the greenhouse variety Geronimo grafted onto Maxifort rootstock.Shop for Johnny's exclusive tomato plants. The easiest method is to plant multiple varieties with different days to maturity. If you start them all at the same time, they will naturally stagger themselves over a longer period. 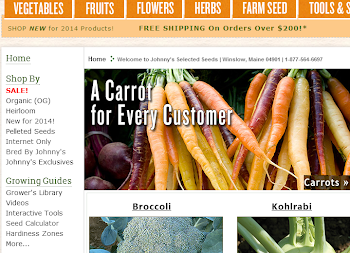 Johnny's broccoli varieties, for example, range from 49 to 68 days to maturity. Plant Blue Wind, Bay Meadows, and Diplomat at the same time and harvest for three weeks. The second approach is to make successive plantings of the same crop. The timing between plantings should be approximately the same as the expected "picking window" during which the crop is fully productive. Cabbage / Cauliflower / Broccoli are often transplanted early May for summer and trans-planted again early July for fall harvest. In other crops like onions, parsnips, and potatoes, different varieties have different maturities, but the crop is harvested once and sold from storage. Growers with long frost-free seasons may want to plant two or more successions of tomatoes, eggplants, and peppers to maintain a high level of production in case disease pressure is high. Some of the most popular herbs and cut flowers also should be planted several times during the season. Basil, for example, might be planted every two weeks if you have a strong market for it and are cutting it heavily. Likewise for cilantro and dill, if your summer weather is cool enough to allow prolonged production. (Both will bolt quickly in really hot weather.) If you keep your first planting well watered after harvest, you can usually get subsequent harvests several weeks later. So if you have made two or three succession plantings, you can alternate between new growth and secondary growth. Succession planting is essential for cut flower growers, because even long-blooming flowers start to look tired after you've been picking them for several weeks. Zinnias are the perfect example -- they will bloom for months, but most commercial growers seed them every three weeks anyway because the plants eventually produce smaller and smaller flowers and often get foliar diseases. The grass 'Frosted Explosion' is another example; the first seedheads are abundant and beautiful, but they start to look tired after a few weeks in the heat. In cooler areas, annuals such as Agrostemma, Ammi majus, and Bupleurum can be succession planted to prolong the season. That won't work as well in really hot summers because the plants won't get enough stem length before they bloom. Single-stem hybrid sunflowers need to be succession planted because each seed produces only one flower. Because they are fairly cold-tolerant, they can be planted early and late, especially in a hoophouse, if you use the daylength neutral varieties such as ProCut, Sunrich, and Sunbright Supreme. Most commercial growers sow sunflowers every week, putting in about 50% more than what they expect to sell each week. The ProCut series is especially uniform, so it's easy to predict how many flowers will be blooming at any given week in the future. A good way to keep track of succession plantings is with a spreadsheet program such as Excel or Numbers. Download an example of Johnny's succession planting spreadsheet. This calculator allows you to input the date of your first planting of each crop. Then it calculates the dates for later plantings, based on the succession recommendations above. It also allows you to input your first frost date, counting back the appropriate number of days to determine the last date to plant and still get a crop before frost. The formulas are embedded in the spreadsheet, but you may want to change them to reflect conditions on your own farm. For example, days to maturity may vary quite a bit for you, depending on variety, time of year, and the weather. By keeping good records of planting and harvest over many years, you get better data about days to maturity and are better able to predict your harvest. You also need to determine, based on your own experience, whether you can plant as late as the final planting date in the calculator. With those caveats in mind, download the spreadsheet here.